As an elected officer and a constitutional officer, the Hunterdon County Sheriff’s responsibilities are quite diverse and governed by statute. The Sheriff’s staff includes undersheriffs, a chief warrant officer, sworn police officers (sheriff’s officers), civilian security guards, and civilian office employees. The Sheriff’s Office provides security for the Hunterdon County Justice Center and its occupants. These include Superior Court judges, their staffs, other court personnel, the probation department, and the Hunterdon County Prosecutor’s Office. The Sheriff’s Office is also responsible for prisoner transportation to and from the Hunterdon County Correctional Facility, between counties within the state and from outside New Jersey. Prisoner transports are not only for Superior Court purposes, but also for municipal courts, extraditions, medical emergencies and appointments. Additionally, defendants arrested on Hunterdon County warrants in other jurisdictions are retrieved from other counties and from other states by the Sheriff’s Office. Moreover, the Sheriff’s Office conducts prisoner escorts to and from court for scheduled appearances, ranging from bail hearings and status conferences to trials and sentencings. Non-support and violation of probation warrant service is a significant function of the Office of the Sheriff, as is the service of domestic violence “temporary” and “final” restraining orders. 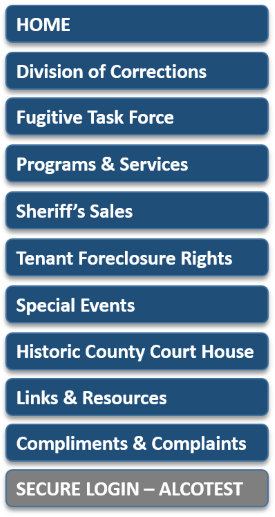 Civil warrants, writs of execution, levies on and postings of property, and the sale of real property after foreclosure proceedings are functions that most people associate with the Sheriff. The Hunterdon County Sheriff’s Office is very active in many citizen programs, such as Project Lifesaver, Child I.D. Program, the Senior ID Program, and the Attorney ID Program, as well as many other service programs.